Echoing the minimalist works of Dan Flavin, Ivan Navarro’s light sculptures subvert the cool detachment of florescent bulbs with their arrangement into recognisable objects. In Homeless Lamp, the Juice Sucker Navarro builds a grocery cart from electric tubing. 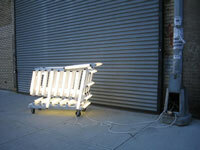 Featured in a video of a 5 hour performance, Navarro has activated the sculpture on the streets of New York’s Chelsea District. In the video, two men break into a municipal power outlet, hi-jacking city energy to feed the power-sucking shopping trolley. Edited to 4 minutes, the action is set to a Mexican revolutionary song from 1905 titled Juan The Landless. As an icon of both consumerism and vagrancy, Homeless Lamp, the Juice Sucker sets a stage where the dichotomies between wealth and poverty convene as a literal and allegorical emblem of power, waste, transience, and opportunistic survival. Basking in an artificial glow, Navarro’s Homeless Lamp, the Juice Sucker exudes a religious aura based in consumption, corruption, and errancy. Ivan Navarro views his work as building upon the unresolved aspects of minimalism, striving to engage viewer interaction and highlight the social and political factors that inherently lie within formal composition. 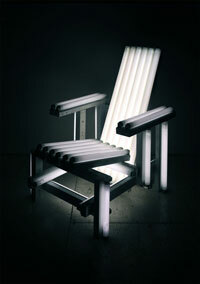 Utilising the aesthetic purity of florescent light bulbs, Ivan Navarro’s White Electric Chair reveals a chilling menace in its sensitivity as a design object. Modelled as fashionable furniture, Navarro’s sculpture poses as desirable commodity; its fragility and high-voltage threat undermining the assuring and authoritative qualities of itsergnomic construction. 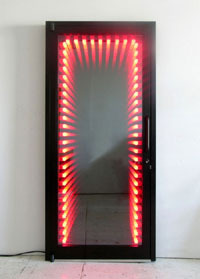 Using Dan Flavin’s Marfa Project – a hallway blockaded by illuminated bars – as a departure point, Ivan Navarro’s Red Holeway re-interprets the optical illusion of perceiving depth of space through light. Condensed for a contemporary age, Red Holeway appears as an elongated corridor flanked by lights, although it is only 4.25 inches thick. Mounted on an aluminium door, Navarro’s holographic effect is achieved through elementary materials: glass, mirror, and light bulbs, creating believable mirage with stringent economy. Roebling Hall. Brooklyn, New York. Blade runner. Gasworks Studios. London. Big Bang. Galería Animal. Santiago, Chile. Galería Posada del Corregidor. Santiago, Chile. Gasworks. Residency Gasworks cultural exchange programme. London. Fondart. Grant Ministry of Education. Santiago, Chile.